Innovision also improves patient comfort by creating the illusion of an enlarged bore. 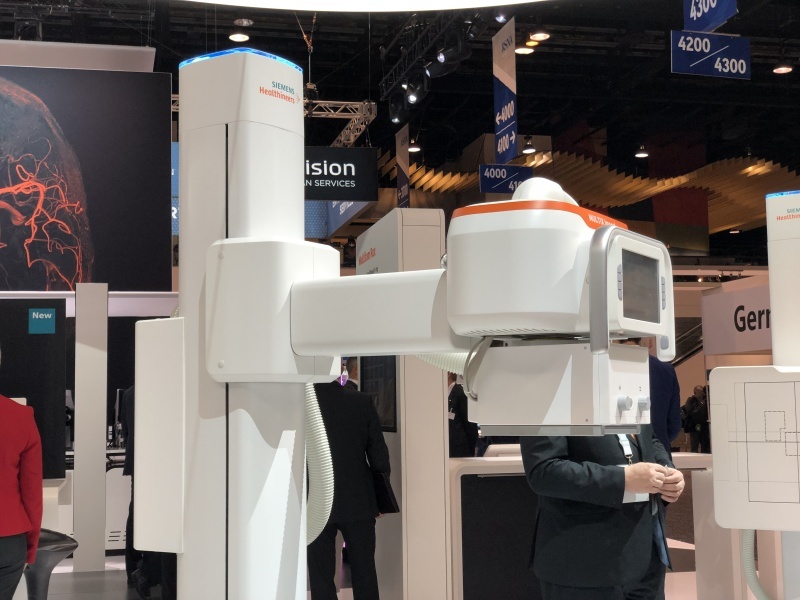 Siemens Healthineers also debuted its Multix Impact floor-mounted digital radiography system, which brings high-end technology to the value market. Along with high-quality imaging technology, the system also provides a high-level patient experience, Hofmann said. An elevating table, unique for this price segment, allows patients to access it more easily, and a touch screen on the tube allows the technologist to stay at the patient’s side. There is also a camera that the technologist can utilize to optimize a patient’s positioning. The system also has a large light that shows the status of the system. For example, blue means it’s in standby mode and green means it’s ready to image. You can let patients know, if they’re a little anxious, when the light turns blue you can breathe again, so they’re a little more comfortable with the exam. The Multix Impact also has the option of automation, including a motorized bucky tray, to make it easier for technologists to use the system and prevent repetitive stress injuries. Siemens Healthineers also introduced the Mobilett Elara Max mobile X-ray system, which comes with a focus on infection control and security. The mobile system, which comes in a pediatric-friendly design, has fewer crevices than its predecessors, no outside cables and comes with an antimicrobial coating, making it easier to clean, Hofmann said. The Mobilett Elara Max also comes with security features, including password protection and a Windows 10 operating system. It’s also possible to securely bring up a patient’s previous images, including CT images, Hofmann said. The Multix Impact and Mobilett Elara Max are both pending FDA 510(k) clearance.